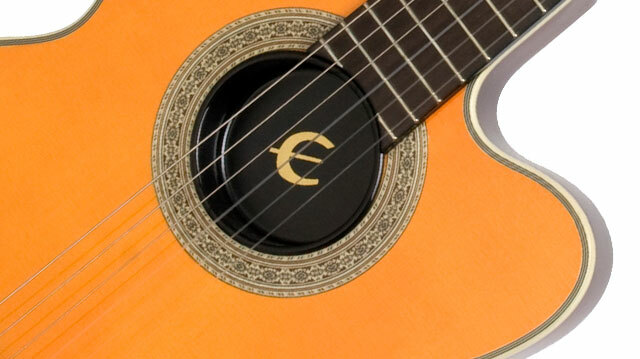 The Epiphone SST Classic nylon-string guitar combines electric and acoustic technology with state-of-the-art construction techniques for a beautiful classical sound that you can plug in without suffering from the feedback problems inherent in amplifying acoustic instruments. Mark Knopfler, Vince Gill, and Chet Atkins are among a few of the 1st class pickers who have found that this new body style is the key to getting a great classical guitar sound on stage. And now, thanks to Epiphone, this incredible technology is available to everyone with the SST Classic. As with all Epiphone guitars, the SST Classic features Epiphone's Limited Lifetime Warranty and is backed by world famous 24/7/365 Gibson Customer Service. You deserve the best. Be original. Try the SST Studio at your Authorized Epiphone dealer today. Unlike traditional classic guitars that feature hollow bodies that are susceptible to feedback when amplified, the SST Classic combines a Spruce top with a solid mahogany body with computer-designed sound chambers. The rosewood bridge and compensated synthetic bone saddle and nut give the SST solid intonation, something you won’t find on budget classical guitars. The sleek design of the SST Classic feels natural, like a well balanced electric guitar, and its incredible acoustic sound lets you enjoy the stage without being tied to a mic. The active SST Classic preamp and a NanoFlex™ pickup, designed in cooperation with Shadow Germany, only amplifies the key parts of the top and bridge that truly magnify the tone of the guitar. 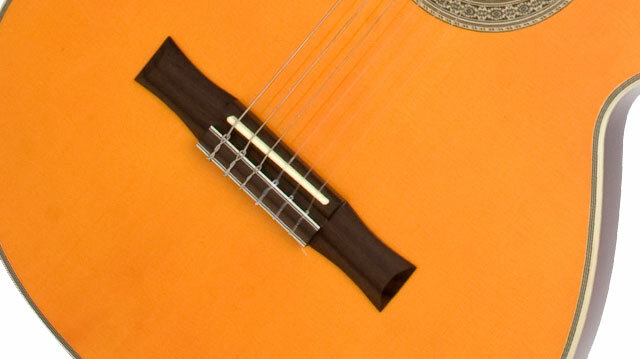 Unlike a piezo, the unique flexible sensing material in the NanoFlex™ pickup features integrated active electronics and “picks up” not only string vibrations but also top and body vibrations without the harshness of a piezo. What the audience hears and what you hear from the guitar is the same—pure tone without feedback. Epiphone has been making acoustic guitars for over 100 years and the Stathopoulo family and the Epi factory's early luthiers always insisted that the secret to making a great guitar that anyone could afford was to know your tonewoods and use them wisely. The SST Classic features a hand-set 25.5" scale mahogany neck with a SlimTaper™ profile and a plain, smooth 24-fret rosewood fingerboard with a 1.75" nut. Also setting off the SST classic is a beautiful Antique Natural (AN) color finish, gold Epiphone hardware, and traditional open classical guitar machine heads. The SST Classic is indeed a "classic" and every guitar player knows their true tone comes through on a great classical guitar. Now you can find your inner tone and bring it to the stage, too. 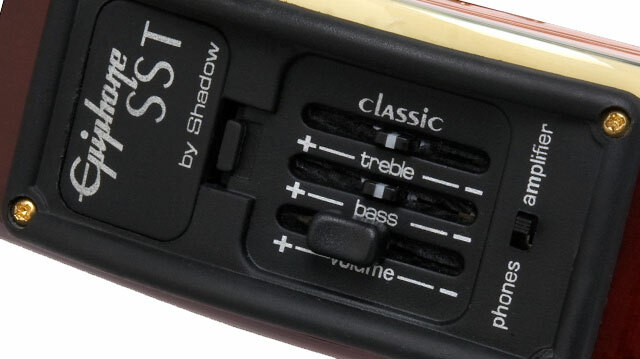 And, the SST's Classical preamp also features a built-in headphone amp that allows you to plug ordinary headphones into the 1/4" output jack for late-night inspiration.